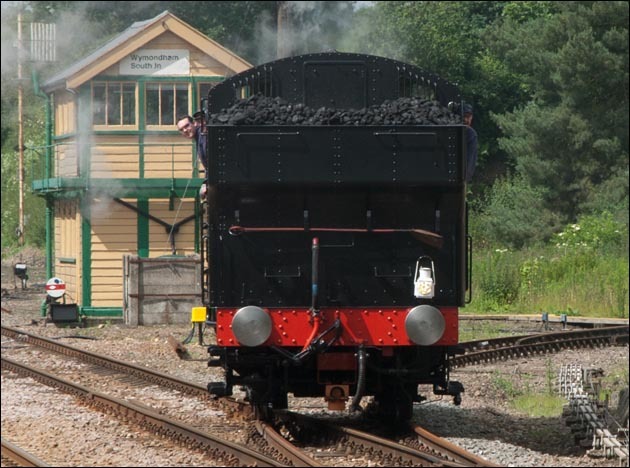 The Titfield Thunderbolt on Saturday the 23rd of June 2012 was from London Kings Cross station to Holt railway station on the North Norfolk Railway. 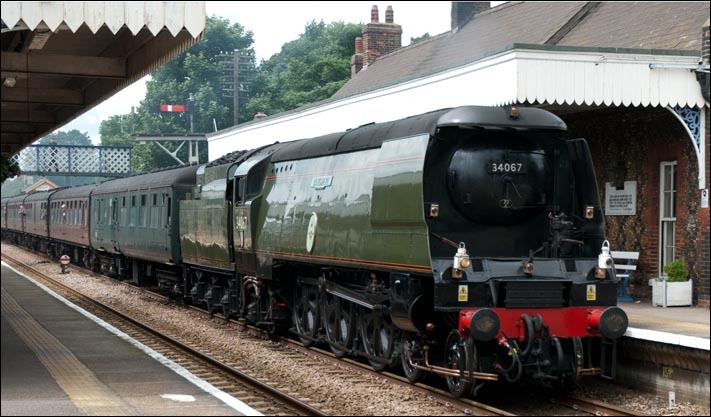 Because the train would have to reverse in Cromer station, a second locomotive was needed to top and tail the parts from Norwich to Cromer and Cromer to Holt. GWR 94xx class 0-6-0PT no.9466 was at the Mid-Norfolk Railway for the summer and was picked for the job as The Mid-Norfolk railway has a mainline connection at the mainline Wymondam station. The 94xx class 0-6-0PT 9466 came light engine from the MNR head quarters at Dereham about an hour be for Tangmere came though with its train. 9466 came by way of the MNR own Wymondham Abbey about a mile away along the connecting railway line which is about a mile long and not used by MNR passenger trains, though to main line Wymondham railway station. 9466 then came on to the main line with network rail passed drivers and fireman and headed to Norwich under its own steam. You can view this video in the full screen Use the button on right of the video. To return from full screen press the same button. This video can be in seen in 720 HDfor those of you who have a fast connection. For those of you who have a faster connection the 1080 HD setting can also be used, but this all but a pipe dream for most of us. Hopefully we shall all soon have a very fast connection! This website is Ukrailways1970tilltoday.me.uk it is a webe site on railways, but it is not just on trains, but all things railways, with photos, which I have taken from the 1970s till now. I take photos of all things railways, steam diesel and electric trains, and signal boxes like this page, any thing that is on the National Rail network, which was BR when I started taken photos. Today Virgin East Coast, Greater Anglia and GBRf are just some of the names on the trains. These names keep changing, but that means I have to keep taking photos. I also take photos of preserved railways with steam diesel and electric trains.There is lots more to add and I keep taking More!